Even within the context of the mañana lifestyle of Southern Mexico, three years to dig a well in Oaxaca does seem extreme, and to most, incomprehensible. Chalk it up to electing to have it dug by hand, changes in personnel, the odd fit of frustration, and seasonal differences in rainfall and water table dictating timing. Americans and Canadians will eventually come to consider water as a resource of finite supply. In Southern Mexico we have already come to this realization. It's been predicted that the scarcity of water in Oaxaca will worsen over time, as a result of climate change and other factors. The past fifteen years have borne witness. The dry season has become longer and dryer, with the rainy season characterized by a corresponding reduction in duration and amount of precipitation. To receive water, Oaxacans rely on a municipal water delivery system, supplemented by water trucks (known as pipas). Supply via the former has been met with a reduction in quantity, quality, and frequency of delivery. The implication is that as the dry season approaches one cannot rely on the delivery of reasonably clean water when it's needed. The situation is worse for residents without cisterns, who must fill small tanks (known as tinacos) of roughly 1,100 to 2,500 liters, or makeshift receptacles such as old stationary propane tanks. The fortunate among us have cisterns with a capacity of anywhere from 5,000 to 25,000 liters. Commercial enterprise cannot rely on the municipal system for their needs, and must order pipas on a regular basis. Toward the end of the dry season when water does come into our cisterns and tinacos, sometimes it's so dirty that residents elect to shut off the valve by the street in favor of purchasing water from pipas. Pipas come in sizes ranging from about 1,100 to 20,000 liters. During the dry season it's sometimes difficult to get a pipa to the house, especially for residences in the countryside or up steep hills. And of course the cost of a pipa is greater at this time of year. One is paying for the driver, truck and fuel, as much as for the water itself. Accordingly, those with small cisterns or only a tinaco end up paying up to threefold more per liter, than those with larger capacity tanks. In the face of this progressively worsening water problem, many residents who think they may be above a water table that is not prohibitively low, are electing to investigate the feasibility of digging or drilling a well, if not for the present, then as a precaution and investment for the future. Drinking water is distinct from municipal and pipa water. Tap water is used only for washrooms, kitchen sinks, doing laundry, and lawns and gardens. Water for drinking and often cooking is purchased at the store or from water trucks selling five gallon (19 liter) jugs. Is there water on the property, and if so precisely where and how far down? How do we find out for sure, and who should we trust? How much should it cost to dig a well? What's the difference between digging and drilling in terms of cost and speed, and advisability of one method over the other? How to go about finding a competent and trustworthy well digger or driller? How much time should the project take, to reach each phase? What diameter should the well be? Are there any guarantees regarding whether or not water will in fact be reached, how far down, and therefore corresponding cost? Will we need concrete rings (known as anillos) placed down inside the well? What volume of water should be expected? What about pumps, filters and tubing to lift the water and move it into a cistern? 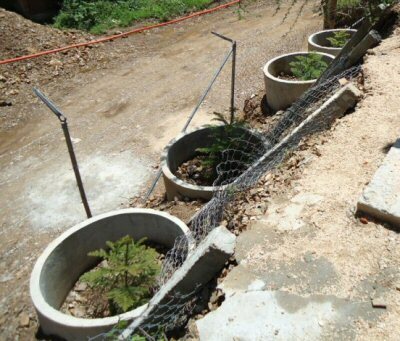 Should there be a separate cistern to keep the well water segregated from the street water? How much should the analysis of the quality of the water from the well impact a decision regarding readying the water for drinking, with chemical cleansers and the like? In retrospect it's easy enough to enumerate the foregoing list, which is far from exhaustive. But its compilation was a work in progress, with issues and decisions to be made arising periodically over the course of three years. There is no course for Oaxacans wanting a well. Our home in Colonia Loma Linda is at the top of a hill facing the street, Calle Sierra Nevada. The lot extends to the bottom of the hill, where there's a predominantly unpaved dirt road which during the rainy season appears more of a stream. There are tell-tale signs of moisture near the bottom of our hill: trees remain green year round, a bit of river reed (carriso) grows near the bottom of our land; a neighbor has healthy banana trees; and he and another neighbor have wells. Our own fruit trees, further up our hill, have traditionally struggled, I assume in part because of the distance to the water table, and of course because of the stone substratum. Below perhaps a foot of hard earth, our land is pure rock. We knew this when we bought it, and were able to confirm it as we watched workers digging three retaining walls for the house, by hand, excavating several feet down. I estimated, based on a conversation with one of the lower neighbors, that if we began digging about ¾ of the way down the hill, we would have to dig a total of about 13 meters in order to reach a sufficient supply of water. The neighbor recommended a diviner / digger. He came by, we told him approximately where we would want to dig, and then he pegged the exact spot using his two lengths of reinforced steel as divining rods. And what if he was wrong? He was pretty old, which did instill a modicum of confidence. At the time the diviner / well digger's price seemed high, at 3,500 pesos per meter. We'd never checked around and didn't have any friends with well-digging experience to guide us. We then spoke to Rogelio, a bricklayer whom we'd known for a few years. He advised us that he knew someone who knew how to dig a well, and that with him (Rogelio) at the helm, we could work out a weekly rate for a small team. We trusted Rogelio, so asked him to coordinate the digging, which he did. We actually had a choice of having the well dug by hand, or by a company with well-digging machinery. An architect friend advised to go with the former, indicating that a commercial outfit would first seek municipal permission for the digging, which may or may not be forthcoming, and in any event would entail delays; so the best would be to go with a more informal arrangement. And after all, that's what our neighbors had done - dug their wells by hand, quietly, without fanfare - and no problems with the municipality. Digging a well by hand, through rock, entails using chisels and mallets, and no more. Some workers use a ladder to descend, while others simply shimmy up and down with the aid of a thick rope. Manufacturers of concrete forms do a brisk business selling anillos for wells. Personnel at one such company helped me to determine that the rings in our case should be a diameter which would, when inserted into the well cavity, result in an opening of one meter (de la luz - of light). At that time there was never any question of whether or not rings would be needed. I assumed they were necessary, because people always talked about anillos, and while traversing the central valleys of Oaxaca I would see anillos at the top of wells, and lying on the ground alongside well-digging projects. I never considered the quality of ground into which the wells had been dug. Some two years later, after having purchased ten rings, I learned that anillos are most often used when the earth is soft, in order to maintain the required well diameter without risk of collapse. I also learned that their use can actually impede water seepage into the well. Shortly after we had moved to Oaxaca, I went to a rare contents sale with a friend, and amongst other things purchased a job lot of nails, chisels, hammers and mallets, figuring that in the course of the balance of my lifetime, some of it would be useful. I had already learned to be much handier around the house than I had been the previous 53 years. Now I had more of the supplies that I used to come across in my father's garage. Rogelio, in consultation with the well digger, comprised a list of materials for me to acquire: ropes, a longer ladder, and buckets. I already had the mallets, and it was just a matter of finding an ironworker (herrero) with the machinery necessary to forge points and flat surfaces on the chisels. I had wrongly assumed that every herrero possessed all such equipment. "Start digging here, where those couple of rocks are lying on the ground; not over there, not over there, it has to be right here, because that's what the diviner said. Ensure that the diameter all the way down is at least ten centimeters wider than the outside diameter of those rings over there. We have to be able to lower them down." The work week on construction sites for Monday through Friday is traditionally 8 a.m. to 6 p.m. with an hour for lunch and usually a couple of impromptu short breaks. Payday is every Saturday at 1 - 2 p.m., when workers leave for the weekend. Work proceeded reasonably well for a number of weeks, without incident, although I had already begun to regret the weekly pay arrangement rather than a fixed amount per meter. It seems as though construction workers will make what they expect they should make, regardless of the arrangement. The difference is that if you pay by the project, or in this case by the meter, you know as best possible what your cost will be. If it's by the week, you're at the mercy of your trabjadores and their work ethic. Mid-digging we decided to leave Oaxaca for a few days, not anticipating being back until late Saturday or Sunday. Friends were minding the house for us. We gave them the weekly pay for the crew, and asked them to pay the money to the boss (in our mind, clearly Rogelio) on Saturday afternoon. Our friend gave the money to the wrong person - the well digger, instead of Rogelio who would traditionally take all the money and pay himself and the two workers. The well digger ran away with the money for all three. Upon our return from our brief vacation we learned of what had happened, and while Rogelio knew the well digger and in fact had coordinated with him to work on our job, the scoundrel was nowhere to be found, and certainly not at his home. It's not totally uncommon for this kind of thing to happen, right down to the culprit failing to return home, and hiding out elsewhere, often in his village in another part of the state. We felt bad for Rogelio, and he felt bad for himself, recognizing that the obligation was his to track down the thief, since he had been working for us based on Rogelio's assurance of his honesty. We suspended work, and never did hear from Rogelio about the outcome, although he has returned to our home to do more traditional bricklayer jobs. In order to get a true reading of the volume of water one can expect to extract from a well, at the worst of times, the digging should proceed and certainly conclude as close to the end of the dry season as possible. That's when the water table is the lowest. Digging during the rainy season is more difficult (though the ground is softer), and certainly concluding the digging during or after the rainy season does not provide an accurate measure of the water one can expect to be able to obtain from the well when times are tough - very dry. A friend finished digging a well a couple of years earlier, only to learn that he had not completed the work late enough in the dry season. He then had to dig a further three meters. Even after this additional work, he learned that there was not sufficient water for the needs of his family and workshop, even after having dug deeper. It's not uncommon for Oaxacans to have to dig down deeper every so often, as changes to the water table occur, for I would imagine a couple of main reasons; more wells having been dug close by, and climactic change. Another friend initially had a nine meter well, and now it's 13 meters. We had become both jaded, and admittedly a bit lax about the whole thing, nevertheless feeling a greater sense of urgency as the months passed. Media reports and advisories from ADOSAPACO, the water commission, contributed to our increasing anxiety. We lamented our unfortunate experience to a neighbor. Amador had done odd jobs around the house for us, such as watering plants while we were away, weeding our garden and planting corn, beans and squash. He was trustworthy, to the point where we had called upon his wife and daughter to baby sit for guests in the house with young children. Amador was a teacher. However, given teachers' salaries, he was always open to working on projects which would enable him to make extra cash. 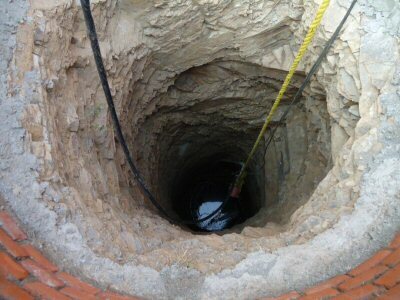 Amador agreed to continue digging the well, on his own, for 3,000 pesos per meter. Sometimes one of his sons would accompany him. He had no experience, except that he knew how to descend and ascend a ladder, and use a hammer and chisel. His son would lift the broken stone in the bucket using the pulley, and if he wasn't available, Amador would do it all himself. The 2009 rainy season was about to begin. Amador exclaimed at the conclusion of a weekend day that he felt humidity at one side of the well, now at about six meters. There had always been concerns: what if there isn't water down there, or what if we have to go twenty meters. Amador assured us that what he felt wasn't simply a consequence of the commencement of the rains. At the same time he asked us for more money, stating that it was becoming more difficult, and now dangerous, being down so deep, and with rain loosening the rock. I told him that I wasn't prepared to pay more now, but when the project was finished I would bump up the pay retroactively from that point in time (number of meters), to 3,500 pesos. We became more confident in Amador's assessment that indeed there would be water, when one day he asked us to buy a pump, tubing and other accessories to get the water out of the well so as to enable him to continue digging. I ran out and bought everything Amador had requested, late that Saturday afternoon when the building material supply stores were getting ready to close. So what if it cost another 4,000 pesos in equipment; we were in business; we had water, in our minds a gusher. And if the pump was only provisional in that eventually we would need a higher horsepower more efficient submersible apparatus, then so be it. And when Amador told us that the chisel points had been broken, of course we'd go back to the herrero, with pleasure, and have them forged again. By chance, about this time, either fortunately or unfortunately we were having some major electrical work done around the house. 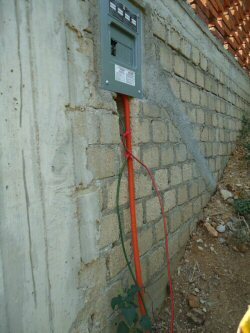 In Mexico, you're allowed to have more than one hydro meter for a single family home, to reduce your electricity costs. Our builder neglected to tell us this, and more importantly that for a large home, with only one meter, the cost would be significant because one pays a premium for electricity after a certain level of consumption. Our electrician, Maestro Ricardo was changing the wiring so as to accommodate five meters instead of only one. It's akin to income splitting with one's spouse or child to reduce the top marginal tax rate, but perfectly legal. Maestro Ricardo was working away at dividing our electrical current into different circuits, when I asked him about the advisability of having a meter dedicated to the well pump and a couple of other outlets on our party terrace near the bottom of the hill. He thought it was a wise idea. He suggested a 220 volt outlet rather than 110, and proceeded to do the wiring for our well pump. Amador worked into the beginning of the rainy season, until he stated he could no longer continue, but would return in three or four months to finish the job. We were at about eight meters, thrilled, and anxious to finish. Our thoughts began to turn to matters such as flow rate and ultimate depth we should go, water analysis, particulars of the pump we would have to install on a permanent basis, and electical current for it, and several other issues which had been pointed out to us over the past couple of years. Amador never returned, even though he continues to be our neighbor. However a friend who had begun digging his own well recommended someone else for us, Fermín. He told me he would not need Fermín to finish his well until about May, 2010, and that we could use him until then, the driest part of the dry season. That served us just fine. We met with Fermín and his son in early 2010, agreed to 3,500 pesos per meter, and a tentative start date. Fermín was the first actual "pozero," or well digger, that we had used. He had dedicated himself to digging wells by hand for the past 17 years, and was teaching his son the trade. "You'll have to get these chisels sharpened again. They're no good to me like they are. And don't worry about the ladder. We don't need it. I do need some thicker rope, though, and we might need more tubing if you'll want to use the water we pump out to water all your fruit trees." I went out and made all the purchases, and then some. I purchased "Y" connectors, shut-off valves, and everything else I thought I might need to get the water to both the fruit trees, and hopefully higher up to our flower boxes. Fermín confirmed that given the quality of the rock he was excavating, we would not need to use the anillos. The stone provided sufficient structural integrity without having to be shored up with concrete. He agreed that using anillos could actually impede water seepage into the well, unless they had large holes in them, and that it just wouldn't be worth the additional expense and effort to adapt and then use them. Fermín lived up to billing, in short order digging down to over 11 meters. It took over an hour every morning to pump out the water from the night before. Then Fermín disappeared. He just didn't show up one Monday morning, and didn't answer his cellular for a few days. Eventually he did respond, and advised that he'd return in two weeks. Five weeks later he was back, advising that we'd probably have to go another three meters down. After three or four days of digging, Fermín told me that he would not be returning. He said that it was now taking him about two hours in the morning to pump out the water before he could begin digging, and that there was about five meters of water to be removed. To Fermín that signified that the well would produce sufficient water for our requirements and that there was no need to dig further. To me that meant we had ourselves an honest pozero who could have continued (he didn't have another job pending, since my friend had altered his plans regarding using Fermín in the foreseeable future), but let us know it wasn't necessary for him to continue. As is often the custom with trades in Oaxaca, a brief "discussion" ensured about how much we owed him (measuring his progress by lowering a stone attached to a rope to the bottom of the well, and then using a tape measure), followed by the friendly departure of Fermín & Son. In my next and final installment, I deal with issues such as flow rate, biological analysis, decorative brickwork and custom iron cover, ongoing issues relating to structural integrity, and matters such as pumps and piping, the additional cistern, and whatever else it takes to conclude such an endeavor. Alvin Starkman has a masters in anthropology and law degree from Osgoode Hall Law School. Now a resident of Oaxaca, Alvin writes, takes tours to the sights, is a consultant to documentary film companies, and owns Casa Machaya Oaxaca Bed & Breakfast, a unique Oaxaca bed and breakfast experience, providing Oaxaca accommodations which combine the comfort and service of Oaxaca hotels with the personal touch of quaint country inn style lodging. This page has been visited times since September 5, 2010.